One of my fondest summer childhood memories was going out for ice cream. Back then, it was a big deal. Any meal eaten out was an event, and going out just for a tasty, cold dessert felt as decadent as a Disneyland vacation. 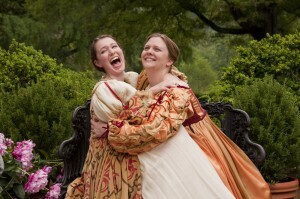 Similarly, The Comedy of Errors from Richmond Shakespeare is this summer’s sinfully delightful treat. It’s an indulgent, belly-laughing, escapist’s way to spend a dog-day evening. The setting of Agecroft Hall is, as always, the perfect backdrop to the company’s summer festival. Combine the Elizabethan Era timeframe of the production, the fact that Shakespeare traditionally performed his plays in exactly such courtyards, and add in the perfect temperature and humidity of Richmond’s weather in general – and especially on this opening night, and the effect was nothing short of magical. Even the turn-off-your-cell phone speech prior to The Comedy of Errors was delicious. Instantly I was wowed by the richness of the costumes’ texture, pattern, and original design (by costumer Elizabeth Weiss Hopper), and laughed at the playful interpretation of what is usually mundane business. With that introduction, director Steve Perigard had set some expectations for what was to come. And Perigard did not disappoint! 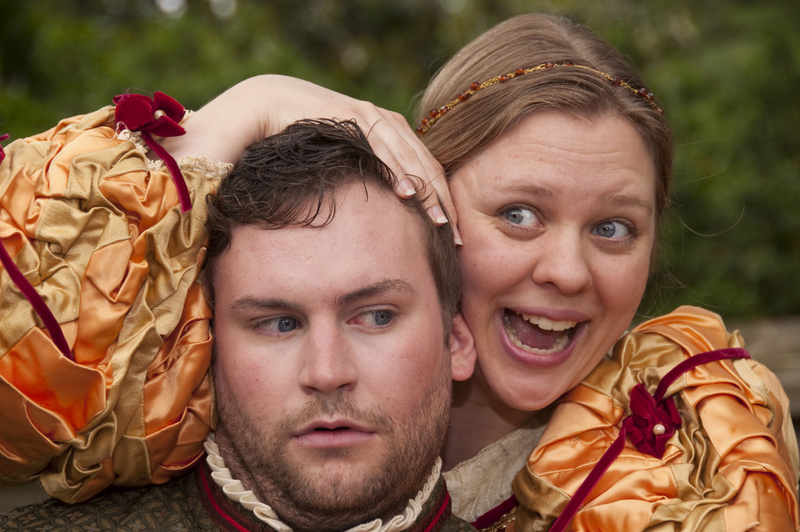 The play itself is a familiar Shakespearean comedy of mistaken identity resulting in many laughs and happy endings. In this case, two pairs of identical twins were separated at birth but also miraculously ended up with the same exact names (Antipholes and Dromio). When the twins are in town (Ephesus) simultaneously for the first time ever, of course, wonderful chaos ensues. I would be hard-pressed to offer an age recommendation for this one, except to say – and rather unequivocally – that kids should be exposed to Shakespeare and this production is a fantastic opportunity to do just that! Talent abounds among the cast, and identifying a single standout is impossible. 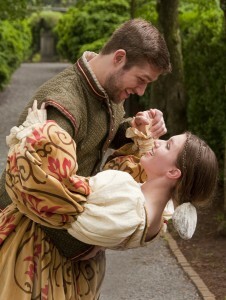 Molly Hood, a veteran of Richmond Shakespeare, shows off every bit of her versatility as the fine actor that she is. Her presentation of Adriana swings wildly from screaming shrew to vulnerable wife in the blink of an eye, combining authenticity with perfect comedic timing. The Dromio twins are a matched set both in their role as servant to the respective Antipholus twin, but also in their comedic talents. John Mincks’ (Dromio of Ephesus) physical antics are actually jaw-dropping, combining grace with athleticism for a flawless execution. James Murphy is likewise agile in stunts and had the audience hooting with laughter with his silly, but not over-the-top portrayal of Dromio of Syracuse. Jonathan Conyers (Antipholes of Syracuse) plays Adriana’s mistaken-identity-husband with comedic perfection. David Janosik performs the goldsmith Angelo with ease and credibility and I found myself wishing to see more of him on the stage. Alexandra Wiles is luminescent as Luciana and Matt Lipscomb plays an energetic Antipholes of Ephesus. Thomas Cunningham gives a commendable and enjoyable performance as the Duke. Michael Knowles provides music with the cello, a rich and unexpected garnish to this summer delight. Hats off to Perigard and artistic director Jan Powell for providing a succulent extravagance to kick off the summer. Finally, a standing ovation and a fond adieu to Richmond Shakespeare’s co-founder and education director Cynde Liffick, who leaves the company after years of dedicated and inspirational service. Susanna Wu-Pong is an associate professor and director of the pharmaceutical sciences graduate program at VCU School of Pharmacy and a writer. She lives in Richmond and is the mother of two talented sons. She blogs about finding positive perspective in life at Silver Lining.